Do you like to treat your guests to distinctive dishes? Or is more efficiency a major priority in your professional kitchen? Quik’s is sympathetic to your practical needs but we can still sniff out culinary trends. After all, a supplier for food service must be able to deal with different, and changing, buyer’s preferences by maintaining a flexible attitude. As a long-term partner for several food-service buyers, we like to offer the variety you are looking for. You don’t need to worry about aspects like flavour, health and convenience any more. All our products have pure flavours and do not contain any unnecessary additives. Use products from Quik’s to let your creativeness loose in the kitchen. Quik’s is constantly adding to our range, which is suitable for the catering and hospitality industry and industrial kitchen. 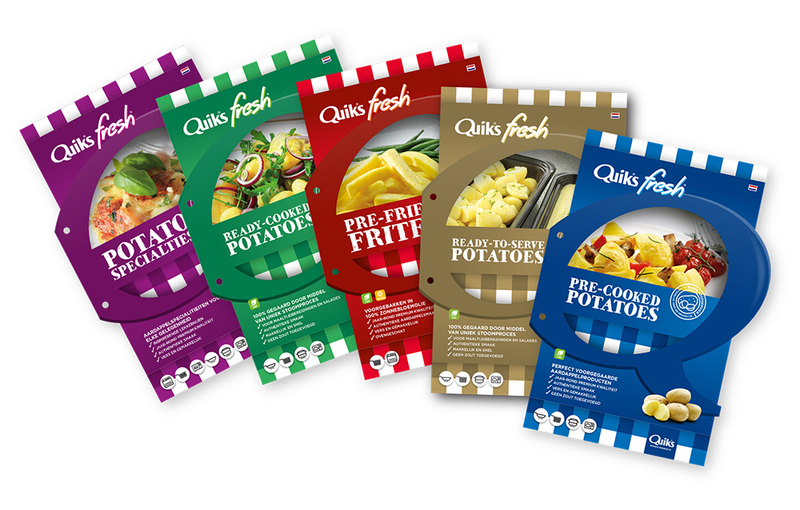 You can choose from a large assortment of potato products by Quik’s, ranging from lovely baby potatoes and artisanal chips to culinary specialities and premiums. If you have any comments, ideas or special wishes, please let us know! We’d love to hear your thoughts on the potatoes in your kitchen!